Power BI 服務 (SaaS) 和 Azure 中的 Power BI Embedded 服務 (PaaS) 都有 API 可供內嵌您的儀表板和報表。The Power BI service (SaaS) and the Power BI Embedded service in Azure (PaaS) have APIs for embedding your dashboards and reports. 此功能意謂著在內嵌內容時，您會有一組功能可供使用，並可存取最新的 Power BI 功能，例如儀表板、閘道及應用程式工作區。This feature means you have a set of capabilities and access to the latest Power BI features – such as dashboards, gateways, and app workspaces – when embedding your content. 您可以完成內嵌安裝工具以快速開始使用並下載應用程式範例。You can go through the Embedding setup tool to quickly get started and download a sample application. 對組織進行內嵌可讓您擴充 Power BI 服務。Embedding for your organization allows you to extend the Power BI service. 執行對組織進行內嵌解決方案。Run the Embed for your organization solution. 對客戶進行內嵌，可讓您將儀表板和報告內嵌至沒有 Power BI 帳戶的使用者。Embedding for your customers provides the ability to embed dashboards and reports to users who don't have an account for Power BI. 執行對客戶進行內嵌解決方案。Run the Embed for your customers solution. 內嵌 Power BI 內容時有兩個主要案例。There are two main scenarios when embedding Power BI content. 內嵌貴組織中有 Power BI 授權的使用者，以及內嵌使用者和客戶而不要求他們有 Power BI 授權。Embedding for users in your organization (who have licenses for Power BI) and embedding for your users and customers without them requiring to have Power BI licenses. 這兩個案例都允許使用 Power BI REST API。The Power BI REST API allows for both scenarios. 對組織進行內嵌可讓您擴充 Power BI 服務。Embedding for your organization allows you to extend the Power BI service. 對組織進行內嵌需要應用程式的使用者在想要檢視內容時，登入 Power BI 服務。Embedding for your organization requires that users of your application sign into the Power BI service when they want to view the content. 貴組織中有人登入之後，他們只能在 Power BI 服務中存取他們自己的和某人已經與他們共用的儀表板和報表。Once someone in your organization signs in, they only have access to dashboards and reports that they own or that someone shared with them in the Power BI service. 對組織進行內嵌的範例包括內部應用程式，例如 SharePoint Online、Microsoft Teams 整合 (您必須具有系統管理員權限) 和 Microsoft Dynamics。Examples of embedding for your organization include internal applications, such as SharePoint Online, Microsoft Teams integration (you must have Admin rights), and Microsoft Dynamics. 您可以完成內嵌安裝工具來針對組織進行內嵌，以開始及下載應用程式範例，該應用程式範例會引導您整合組織的報表。You can go through the Embedding setup tool to embed for your organization to get started and download a sample application that walks you through integrating a report for your organization. 對客戶進行內嵌，可讓您將儀表板和報表內嵌至沒有 Power BI 帳戶的使用者。Embedding for your customers lets you embed dashboards and reports for users who don't have an account for Power BI. 對客戶進行內嵌，也稱為 Power BI Embedded。Embedding for your customers is also known as Power BI Embedded. Power BI Embedded 是一種 Microsoft Azure 服務，可讓獨立軟體廠商 (ISV) 和開發人員透過以容量為基礎的每小時計量付費模型，將視覺效果、報表和儀表板快速內嵌到應用程式中。Power BI Embedded is a Microsoft Azure service that lets independent software vendors (ISVs) and developers quickly embed visuals, reports, and dashboards into an application through a capacity-based, hourly metered model. Power BI Embedded 可為 ISV、其開發人員及客戶帶來好處。Power BI Embedded has benefits for an ISV, their developers, and customers. 例如，ISV 可以免費使用 Power BI Desktop 開始建立視覺效果。For example, an ISV can start creating visuals for free with Power BI Desktop. ISV 可以藉由減少視覺效果分析開發工作並利用差異化的資料體驗在競爭對手中脫穎而出，加快應用程式上市的速度。ISVs can achieve faster time to market by minimizing visual analytic development efforts and stand out among the competition with differentiated data experiences. ISV 也可以選擇針對內嵌分析創造的價值收取較高的費用。ISVs also can opt to charge a premium for the additional value created with embedded analytics. 使用 Power BI Embedded，您的客戶完全不需要了解 Power BI。With Power BI Embedded, your customers don't need to know anything about Power BI. 您可以使用兩種不同的方法來建立內嵌應用程式。You can use two different methods to create an embedded application. 其中一個選項為使用 Power BI Pro 帳戶。One option is to use a Power BI Pro account. 另一個選項為使用服務主體。Another option is to use service principal. 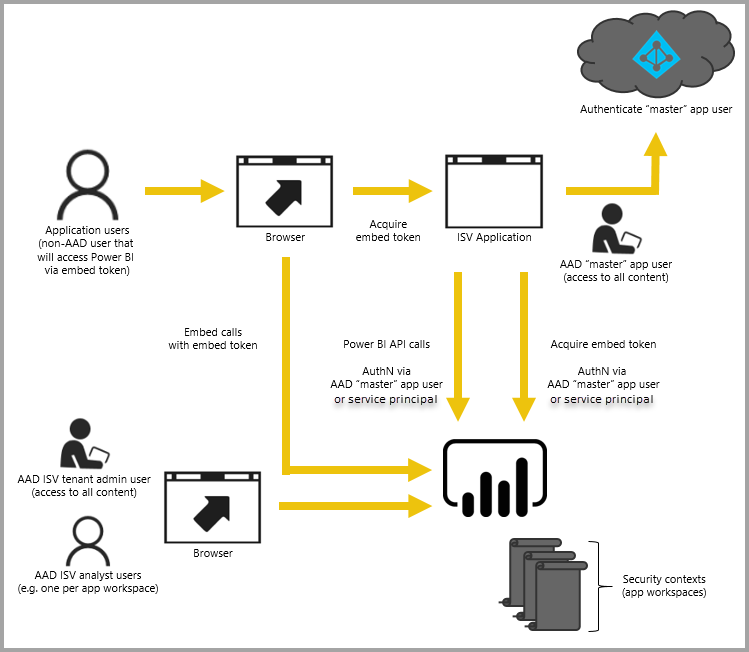 Power BI Pro 帳戶將成為應用程式的主帳戶 (將此主帳戶視為 Proxy 帳戶)。The Power BI Pro account acts as a master account for your application (think of this master account as a proxy account). 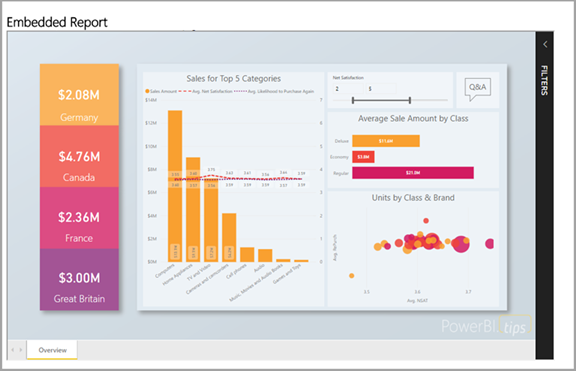 Power BI Pro 帳戶可讓您產生內嵌權杖，以提供存取 Power BI 服務內應用程式所擁有和管理的儀表板和報告。The Power BI Pro account allows you to generate embed tokens that provide access to dashboards and reports within the Power BI service that are owned and managed by your application. 服務主體可以使用「僅限應用程式」權杖，將 Power BI 內容內嵌至應用程式。Service principal can embed Power BI content into an application using an app-only token. 服務主體可讓您產生內嵌權杖，以提供存取 Power BI 服務內應用程式所擁有和管理的儀表板和報告。Service principal allows you to generate embed tokens that provide access to dashboards and reports within the Power BI service that are owned and managed by your application. 使用 Power BI Embedded 的開發人員可以花時間專注在建置其應用程式的核心競爭力，而不是將時間耗費在開發視覺效果和分析。Developers using Power BI Embedded can spend time focused on building the core competency of their application rather than spending time developing visuals and analytics. 開發人員可以快速滿足客戶報表和儀表板的需求，並且能夠輕鬆地內嵌完整記載的 API 和 SDK。Developers can rapidly meet customer report and dashboard demands and can embed easily with fully documented APIs and SDKs. 透過在應用程式中啟用輕鬆巡覽資料探勘，ISV 可讓客戶在來自任何裝置的內容中進行資料驅動的快速決策。By enabling easy-to-navigate data exploration in apps, ISVs allow customers to make quick, data-driven decisions in context from any device. 雖然內嵌相依於 Power BI 服務，但客戶不相依於 Power BI。While embedding has a dependency on the Power BI service, there is not a dependency on Power BI for your customers. 他們不需要註冊 Power BI，即可檢視應用程式中的內嵌內容。They do not need to sign up for Power BI to view the embedded content in your application. 當您準備好進入生產環境時，必須將應用程式工作區指派給專用容量。When you're ready to move to production, your app workspace must be assigned to a dedicated capacity. Microsoft Azure 中的 Power BI Embedded 提供與您應用程式搭配使用的專用容量。Power BI Embedded in Microsoft Azure, offers dedicated capacities to use with your applications. 如需如何內嵌的詳細資訊，請參閱如何內嵌 Power BI 內容。For details on how to embed, see How to embed Power BI content. 現在，您可以嘗試將 Power BI 內容內嵌至應用程式，或嘗試對您的客戶內嵌 Power BI 內容。You can now try to embed Power BI content into an application, or try to embed Power BI content for your customers. 什麼是 Power BI Embedded？What is Power BI Embedded?